Ralph Brand has now been a taxi driver for far longer than he was a footballer, but when he speaks about the game, and especially when the conversation involves Rangers, his eyes light up like the "for hire" sign on the sleek vehicle in which he ferries passengers around the streets of Edinburgh. Now 74, he is in remarkably good shape. He still jogs, plays golf and, having been recruited to the corps of former players who meet and greet guests on matchdays at Ibrox Park, he still watches the team for whom he claimed 206 goals in 317 games. Only Ally McCoist and Derek Johnstone have scored more times for the Ibrox club, something he no doubt reminds Jimmy Millar, his old strike partner. Some make the claim that they are the finest partnership in Rangers' history. With all due respect to Kris Boyd and Kenny Miller, when people at Ibrox refer to 'B & M' it's still the vintage pairing to which they are referring. Brand and Millar are still inseparable and travel from Edinburgh together to perform hospitality duties at Ibrox, though not in the taxi Brand has driven since 1973. Ironically, they first played together in a match against Hibs at Easter Road in 1959, and the Edinburgh-born pair destroyed one of their local teams. Brand scored four times in the 6-1 League Cup victory, while Millar claimed one. Later, Brand would even play under Millar for a season at Raith Rovers, although the synergy briefly deserted them. The Stark's Park club were relegated. "We used to laugh and joke about it (their partnership]," says Brand. "I'd say: 'when he turns over in bed at night I just do exactly the same thing'." They will head through again tomorrow for the crucial clash with Celtic at Ibrox, where they will welcome match day guests at the Argyle Suite. "People come to the suite and bring their father, or grandfather, because they know Jimmy Millar and Ralph Brand are in the suite," he says. "To see the pleasure the ordinary supporter gets.... I can't do the pomp and ceremony. But to see that gives me pleasure. My usual chat to them is: 'if you got half the pleasure I got playing for that fine team, then I understand how you feel." We are sitting in the Edinburgh home in which he has lived since it was constructed, in 1960. It was once referred to as "the house football built" in a newspaper article, but it was not the first item Brand splashed out on after he had begun to earn a wage from Ibrox, having been signed as a teenager by Bill Struth. "I went to a tailor in Leith Walk in Edinburgh and got myself a four patch pocket jacket, with a shawl collar," he recalls. "I had royal blue trousers and went through to training after I had bought this. When I arrived, there was a phone call to tell me I had to see Mr Struth. He had just recovered from his illness and had an artificial leg. "He looked up at me and took his walking stick and crashed it down on top of the glass-topped desk. 'You are now a Rangers player, Ralph,' he said. I want you to go back and change your clothes and come back again." Brand was not about to protest that a return home meant a journey to Edinburgh. The outfit, he smiles, was just "too up to date" for a club which, even now, face accusations of living in the past - or at least some fans do. "Everywhere I went I represented Rangers Football Club," Brand points out. Even now, he is conscious of the responsibility, although he is not so craven as to temper his views, and rarely has been. He is not a fan of modern football and the current Ibrox side includes "no-one who particularly impresses me", although he felt Pedro Mendes could have made the big difference had he stayed longer at Ibrox. Like Brand, Boyd was a goalscorer but had to rely on something other than speed and agility, qualities which came naturally to the former. Boyd headed south, just as Brand did. "I saw him improving," is Brand's take on Boyd, who is now struggling to make the same impact in England. Brand, too, found the going harder, though mostly because he was played out of position at Manchester City. He did at least help the side win the Second Division in his first season. Given Brand's profession, it's perhaps not surprising that he should be keen to take you on a journey. The Fifties and Sixties is the destination, and, after the recent weeks and months of Old Firm-related controversies, such a trip to the past is made to seem an inviting prospect. He had no time for tribalism, and didn't even support either Hearts or Hibs. "I was just a football fan," he says now. "I had a connection to Glasgow through relatives," he adds. "When I was a young boy in the school holidays I used to go through and stay with my uncle and auntie in Springburn. And in the Glasgow holidays my cousins used to come through and stay in Edinburgh. "My uncle Alec used to sing the Rangers songs to me - I don't mean the sectarian ones, I mean the real Rangers ones." 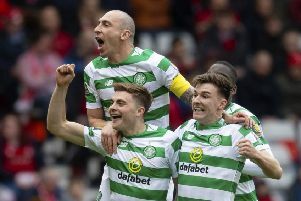 Brand relished the matches against Celtic, though in an era when Rangers faced a more stringent test from the likes of Hearts, Dundee and Kilmarnock, Old Firm matches rarely carried the significance of this weekend's meeting. "The only nastiness came when someone might have a go at you in the game, and you had a go back," he says. "It wasn't because they were a Catholic or you were Protestant. I had a lot of friends in the Celtic team, including Billy McNeill.We were all just footballers." He even tells an intriguing story about Jock Stein raising the possibility of Brand playing for Celtic. "When I was preparing to leave Rangers, I was playing in the reserves in a game against Celtic at Parkhead. When I walked up the tunnel at half-time Jock Stein was walking beside me. He said: 'Hi Ralph, how are you doing? I would love you to come here'. "Having been born on the east coast, I never knew anything about it (the sectarian issue]," he says. "I went through there and was sitting (in a dressing room] next to all my football heroes. It was all chit chat, it was all in fun. It was not serious. You had a joke and when it came to the game, you wanted to beat them (Celtic] so much. But that's where it ended." Where you may wish to go and where Brand wants to take you might not necessarily be the same place. Research into Brand's life, as well as revealing just what a prodigious striker he was (in addition to all the Rangers goals, he also scored eight times in eight appearances for Scotland), uncovers a curious story of Brand having been the one to "make the sectarian policy at Rangers public knowledge", in the Sixties. Like the portrait you suspect he keeps in the attic, this is where the offending copies of the newspaper are now stored. Brand regrets it now. He was young - only 29 - when he left for Manchester in a 30,000 deal, though his comments, given to the News of the World, actually lifted the lid on Rangers' out-dated training techniques. Brand had reason to be frustrated by some aspects of the club's conservatism. "Later, we used to slip them on before going out. In fact (Symon] brought out his own boot - the JSS (James Scotland Symon]. It was an old fashioned one, with the same hard toe and the high bit at the back to protect your ankle." Symon might have used this boot to kick Brand all the way down to Manchester, when he left in 1965. The player was unhappy at being denied the chance to study for his coaching badges at Largs by Symon, who, Brand recalls, did not like people "coming in with different ideas to himself". "I wrote the articles explaining why I had left," he recalls. "But the way they came out in the paper was not the way I had intended. When I was down at Maine Road I asked my manager Joe (Mercer] if he could get the News of the World to cancel. But they didn't There was a bit of controversy.I remember Rangers were playing Leeds (in 1967/68] and of course I went round to see the lads. When I approached Symon he really nailed me. 'You are not welcome,' he said. "Yet afterwards, when I had come back home to manage Albion Rovers for a while, and he had moved to Partick Thistle, I went round to see him and he was a different gentleman. He was very friendly. The pressure of being a Rangers manager got to him. He was always a nervous type, but his own man. I asked him about one or two players, and we had a good chat. It was all nice and friendly. Everything was in the past. I was glad about that." The impact managing one side of the Old Firm can have on a man is topical, given Neil Lennon's current troubles. It's not just a professional choice to accept such a task, it is also a life choice. Even back then this was the case, Brand points out. "You ask David White," he says, of the man who found it hard to reach the standard Symon set at Rangers. Although he had his fall-outs with Symon, he believes the manager did not get the recognition he deserved at Ibrox for rebuilding after Struth had moved aside. As for Brand, does he still gain the recognition he deserved as he ferries passengers around the streets of the capital, something he was doing even as recently as yesterday? It doesn't happen so much nowadays, he shrugs. "Because we have a partition now, and speak through a speaker, you don't turn round so much," he explains. Indeed, it wasn't in his taxi where he was last recognised. Rather, it was while buying a bed. The shop assistant referred to him as the "great Ralph Brand", after the former footballer had lain out on the mattress to test it out. "I had the great Ralph Brand on my bed" is a boast even this modest taxi driver could appreciate.